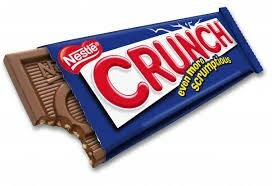 Nestlé Crunch is the name of a chocolate bar made of milk chocolate with crisped rice mixed in, produced by Nestlé. Its current slogan is, "For the Kid in You." It was first introduced in 1937.